It's the new one! 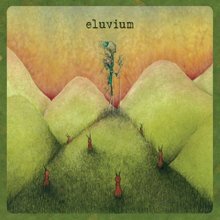 If you're unfamiliar with Eluvium, check out the other Robosexual reviews. His last full-length, Talk Amongst The Trees, was a far more atmospheric affair than his earlier piano-only work, and the newer EP When I Live By the Garden and the Sea was a mixture of both. The feel of the latter is what pervades on Copia. There's a little more orchestration, more instruments, but it's not the gauzy, narcotic drone of Talk Amongst The Trees. I kind of miss that sound, but there's enough of it on that album to satisy. So, if he began with a keyboard, moved on to his guitar and loopstation, Copia is where he seems to be experimenting with a more diverse instrumentation within each song and within the album itself. Violins and oboes speak to one another on "Requiem for Frankfort Avenue," while many-stringed drones make up "Seeing You Off the Edges" and "After Nature," whiel the solo piano of "Radio Ballet" would feel very comfortable on An Accidental Memory In Case Of Death. The long tracks are pretty and don't overstay their welcome, but they also don't have the strength of his older long format songs like "Taken" or "Behind Your Trouble" - the first of which gets better with time and the second of which is like a mini-EP. To be honest, some of the tracks sound more like Max Richter than Eluvium, which is only bad if you don't like Max Richter. I have always liked Eluvium's different sound, however, and while I like all the tracks, I'm concerned that his new instrument set is making his compositions less distinctive. That sounds harsher than it is, because both artists are very skilful, and there are certainly enough tracks on Copia the likes of which you won't find anywhere else. Here's "After Nature," and here's "Amreik," by Eluvium. Hey. Intern with NPR's All Songs Considered, here. You can hear Explosions in the Sky and Eluvium live from the 9:30 Club in Washington, D.C. on Saturday, March 17. Browse over to our Web site at around 9 p.m.
We'll have photos from the show and a live concert chat, too. THANKS A LOT . cool . I feel strongly about information and love learning more on this. To be honest, some of the tracks sound more like Max Richter than Eluvium, which is only bad if you don't like Max Richter. When a person get drunk in a dream, he will be this fantasy into the fuzzy enthusiasm as true, wine. I’m pleased for this beneficial excellent page; this is a form of subject that sustains me although out the day. Thanks for this, I agree with most of your points. Good to see someone with the same opinion. That woman is young Naomi Biden who is tagging along with her grandfather for a trip that will be forever a lifetime experience. Through your depth of writing, I seem to see the you on eagles from, Wolf LongHangHuBu sang the gigantic; Seem to see the you holding up RuChuan large, write all the articles of the wisdom of expression; Imitate the saw you press sword four attend to, point gallant spirit of jiangshan!!!!! The building Lord, you write is too great. The only thing I can do, only the top this post to this matter. Thanks for the introduction! I am always reading your blog and i like the way you blogged about this topic which is of course very interesting. Face a son of the building Lord, I so shocked by can hardly move, the building Lord that kind of the paper to crack a heavy-handed, but I can't help but again and again to turn over a son of the building Lord, whenever I see a, appreciated the feeling of the IP number is long, I always want to points, whether it's in the clever god flexible appearance, that can make people do not know the meat in March, make the person has lingering, three days on the feeling.